The granny gear is the smallest cog on the front crankset of your bike. If you haven’t already become best friends with it, you may need to start! Gear ratios on touring bikes depend on a number of factors: where you plan to travel, the terrain, your experience, how strong you are as a rider and, of course, how much gear you’re lugging around. I recommend picking gears for all occasions, that is, having gears low enough to go up the steepest climbs, and also having gears high enough so you don’t ‘spin out’ when the wind is on your side. You can never have a low enough gear if you’re planning to tackle a bit of everything. A good granny gear is so small that you can move at walking speed when using it. The best way to compare chainring and cassette combinations between bikes is to check their gear inches. They’re very easy to calculate: it’s the diameter of the wheel, times the size of the front chainring, divided by the size of the rear cog. With this information you can compare bikes with different wheel sizes and drivetrain setups. 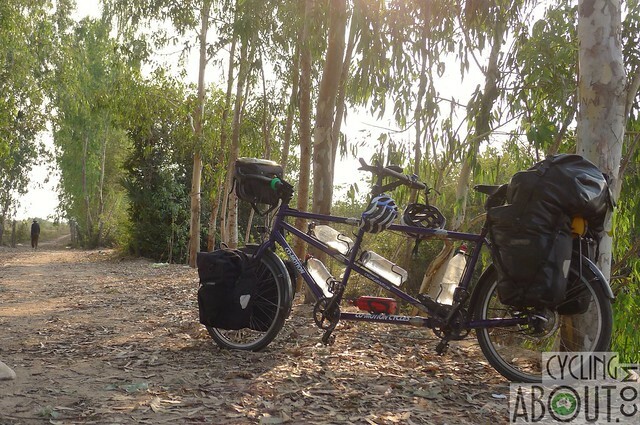 On a touring bike, 18″ is a great low gear and 113″ is a good high gear. I do my calculations with Sheldon Brown’s Gear Calculator. 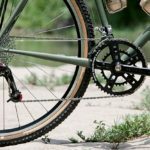 Given that touring triple cranksets (48-36-24) have a range of 18-113″, how does that compare to drivetrains on different bikes capable of bicycle touring? Traditional road, compact road and a road triple cranksets. Traditional CX and CX1 cranksets. MTB single, double and triple cranksets. Alfine 8, Alfine 11 and Rohloff hubs. It really depends on where you’re riding, the terrain, your experience and how strong you are. Here’s a guide I’ve put together for an “average” rider who is looking for enough gears to get up hills on their tour. Although a wider-range of gears is often a necessity on touring bikes, it’s also worth noting that there are bigger gaps between each gear than on lower-range drivetrains. These gaps will be most noticeable on flat terrain when you’re searching for that perfect gear to maintain your pedal cadence. Wide-range drivetrains aren’t a problem for many cycle tourists, but if you are doing mostly flat tours, it may be worth considering a narrower-range cassette to fine tune your cadence. 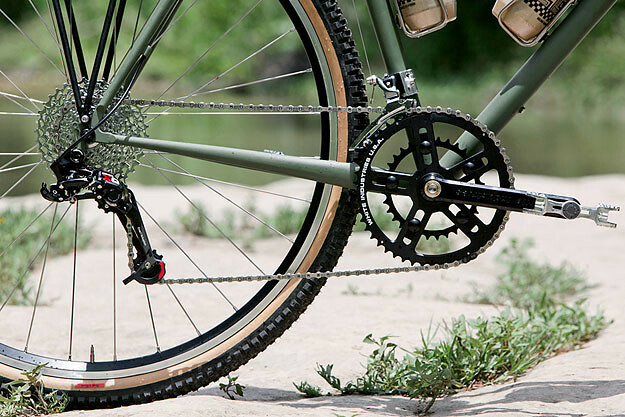 Modern drivetrains currently use 10 and 11-speed chains, cassettes and chainrings. Manufacturers are slowly phasing out 7, 8 and 9-speed drivetrains, although spare parts will still be available for the time being. Although 10 and 11-speed drivetrains use a narrow chain, they’ve proven to be just as strong and reliable as the outgoing gear. Take note though, 11-speed drivetrains require a wider cassette body on your hub than the systems up to 10-speed, so compatibility with older wheels can be a problem. Measuring the difference in width between 10 and 11-speed chains. Another issue with running 10 and 11-speed on touring bikes is that not all shops around the world will have access to these somewhat modern parts. Head down to Cycling in Remote Areas for more on this topic. A touring crankset has a wider range of gears than a mountain or road bike crankset. The smallest chainring is often 24t and the largest 48t with a 36t servicing the middle gears. Touring cranksets require a long-cage MTB derailleur to cover the large differences in chainring sizes. Touring bikes commonly use three chainrings on the front crankset, although new crankset/cassette technology permits a wide spread of gears using both single and double chainring setups. Most MTB double cranksets will give you enough ratios to get up any hill with panniers. With a single chainring drivetrain, you’ll have to sacrifice some high or low gears compared to 2x or 3x. Single chainring setups tend to be best left to light touring bikes completing relatively flat tours. Some manufacturers (such as White Industries) mount their chainrings onto their cranks with a splined interface, rather than using bolt-on chainrings. This system allows for various chainring configurations with a maximum of a 24 teeth gap between the biggest and smallest chainrings (eg. 48x24t or 50x26t). This system allows for the same range as a triple touring crankset. A splined crankset offering a wide gear range with only two rings. BCD is the bolt measurement used for different types of chainrings. MTB and road chainrings are incompatible due to differences in their respective BCDs. Traditional road and compact road chainrings are also incompatible. The bearing interface that your crankset spins on what is called the bottom bracket. BBs screw directly into the threaded BB shell on a bike frame. Older-style BBs are commonly know as square taper. Square taper systems work just fine, and spare parts are available in most bike shops around the world. Next came external BBs which still screw into the BB shell, however the bigger bearings sit outside the BB shell. The system is stiff and reliable. Using external bottom brackets, I’ve managed to cycle up to 20,000km before needing to replace them. External BBs are standard for many modern road and mountain bike cranksets. The latest technology for bottom brackets is press-fit, whereby the bearings are pressed rather than threaded into the bottom bracket shell of a frame. You probably won’t find this available on many touring specific bikes, but it is becoming very popular on cyclocross, road and mountain bikes. Square taper, external and press-fit bottom brackets. Cassettes are getting wider and wider, due to the push by the cycling industry to move away from triple chainring drivetrains. Wide cassettes are finally allowing people to tour successfully on double chainring setups. Standard road cassettes generally max out at 27t, however there are now road cassettes that get to 32t (you must use a long cage road derailleur with these). MTB cassettes are available from 11-32 to 11-36t (long cage MTB derailleur required for double and triple setups). Shimano and SRAM have recently brought out cassettes with 40t and 42t cogs. These wide range cassettes are designed primarily for mountain bikes to run a single front chainring. While the SRAM cassette requires you to have a specific hub with a XD driver, the Shimano cassette will fit onto existing 11-speed hubs. Road cassette, MTB cassette and a wide-range cassette. A wider freehub body is required on your hubs in order to fit an 11-speed cassette. Please check whether your hub is compatible before setting your bike up. In order to turn regular 10 speed 11-36 cassettes into 11-40t, a number of companies have cropped up to make space by removing one of the smaller cogs (16t or 17t) with a bigger one (40t or 42t). This setup is proven and works well on single drivetrains. Check out Hope or OneUp for more. A 42t cog has been added to this MTB cassette. Not all derailleurs work with all cassettes and chainrings. The derailleur cage comes in multiple lengths, depending on what cassette you’d like to use. Any triple drivetrain must use a long cage derailleur. Short Cage Derailleurs: Accept cassettes up to 28-30t. Long Cage MTB Derailleurs: Accept cassettes up to 40t. Short cage road, long cage road and SRAM 1×11 derailleurs. Bikes with internally geared hubs often have a reduced gear range compared to a touring crankset and wide range cassette. The Rohloff hub is the only product that gets close with a 526% jump from the smallest gear to the largest. Comparatively, Shimano’s Nexus 8-speed has 309% range and the 11-speed 411%. The minimum gear ratio you can use with a Shimano hub is 1.9:1. Therefore a 26″ 8-speed bike will have gears as low as 26-79″ and a 700c bike will go as low as 27-84″. A 26″ 11-speed bike will have gears as low as 26-105″ and a 700c bike will go as low as 27-111″. The minimum gear ratio you can use with a Rohloff hub is 2.5:1. Therefore on a 26″ Rohloff bike, you can get as low as 15-95″ and on a 700c bike you’ll get 19-102″. Pinion gearboxes have a huge range (636%), providing both lower and higher gears than a Rohloff hub. Shimano Alfine 11s, Rohloff 14s and a Pinion 18s gearbox. In the western world, it is becoming harder and harder to obtain high-quality spare parts for 7, 8 and 9-speed, however in the rest of the world you probably won’t find any 10 or 11 speed spare parts! If you’re off on a big adventure through remote areas of the world, I recommend using a 9-speed drivetrain due to part availability. It is much more likely that you’ll find chains, cassettes, chain links and chainrings. It was hard for me to obtain bike parts in Cambodia.